"Like" Southern In-Law and Eskal on Facebook and leave a comment on each page saying "I'd LOVE to win the Eskal Hamper from Southern In Law!" Follow @southerninlaw on Twitter and tweet "I've entered @southerninlaw 's Eskal Hamper Competition http://tiny.cc/eskalgiveaway"
Competition closes Sunday 31st March, 2013 at 9am EST. The winner will be notified by email. This competition is only open to Australian Residents. I'm liking Eskal - and loving the giveaway. After all the wonderful recipes lately, this is cherry and whipped cream! I "Like" Southern In-Law and Eskal on Facebook and I left a comment on each page saying "I'd LOVE to win the Eskal Hamper from Southern In Law!" I like both pages and commented on each page. I "like" Eskal on Facebook and left the requested message. Have liked and posted on Southern In Law and Eskal Facebook pages. 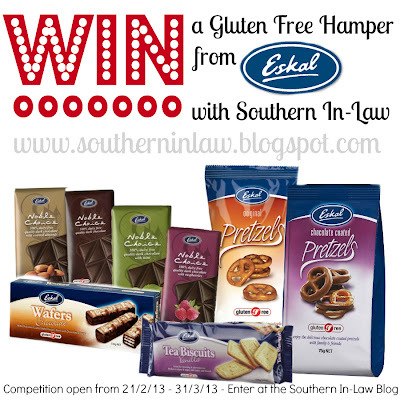 I'd LOVE to win the Eskal Hamper from Southern In Law!" About time, gluten free AND nice sweet choccies, at least someone hasnt forgotten we also have a sweet tooth!!! Entered on Facebook and Twitter.